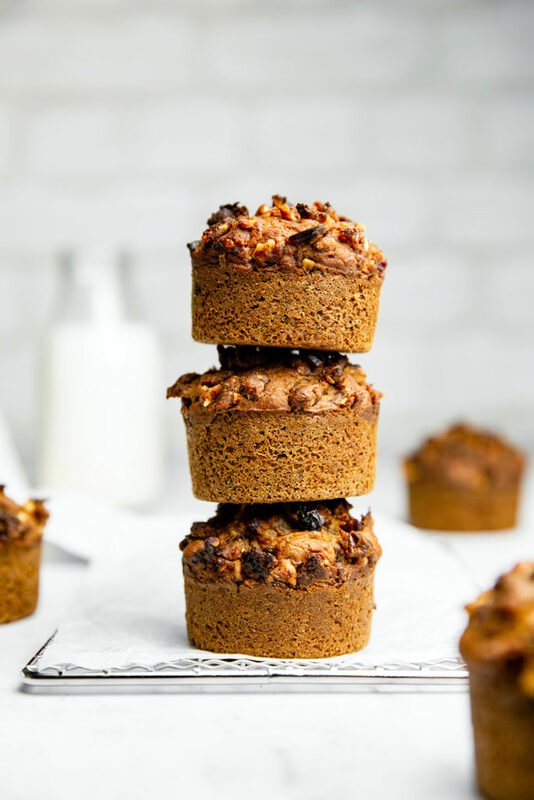 These streusel muffins with dry cranberries, walnuts, zesty orange and poppy seeds are the best seasonal little treat to indulge your sweet tooth. 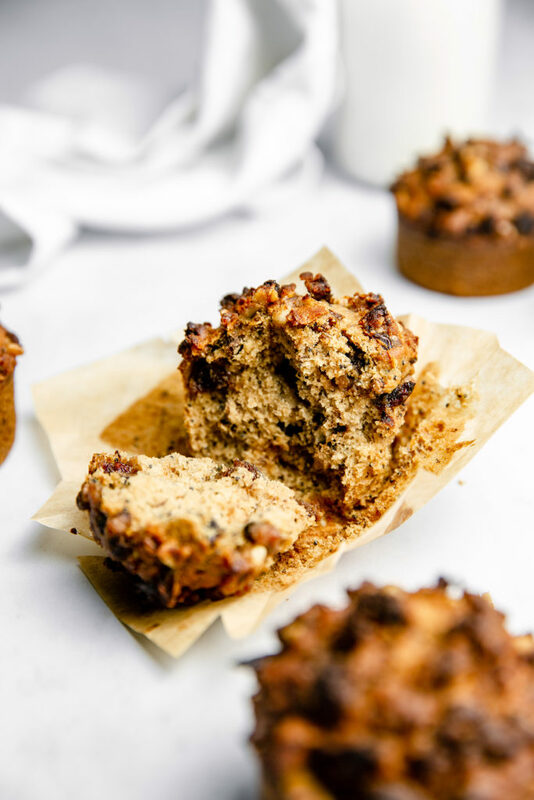 They are the perfect balance between fluffiness and crunchiness with a nutty streusel on top. Packed with wholesome ingredients and fibers, low in sugar and fat, they’re also a super healthy alternative to regular sweets. Enjoy them in the afternoon with a cup of hot tea. It’s that time of the year early Spring when I want to make everything cranberry, orange and nuts. I think this flavors combo perfectly work and is the most comforting ever! The natural sweetness of the dry cranberries combined with the acidity and power of orange and the crunchiness of walnuts. I use it everywhere, one of my current obsession is a warm creamy oatmeal topped with cranberries, walnuts and sometimes grated carrot. 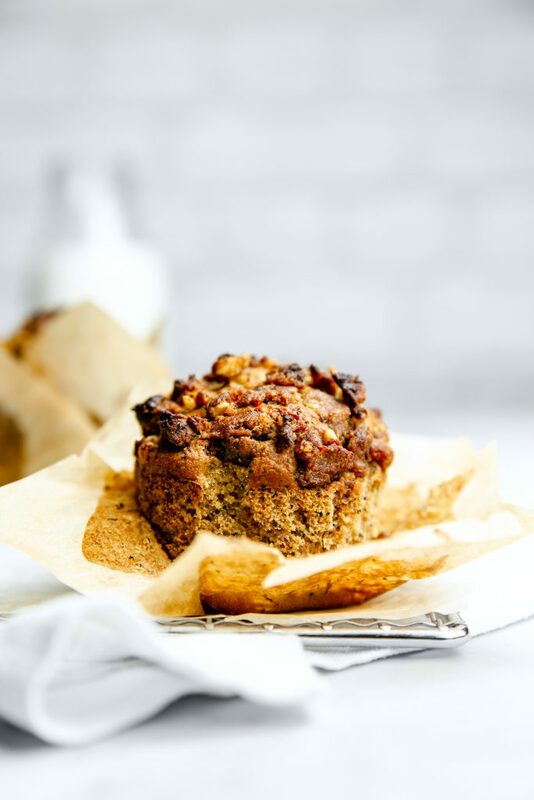 But today it’s a streusel muffins recipe I want to share with you. Muffins are among my favorite snack. I think they’re really cute and personal : having a muffin is just like having your little own cake, that you can take your time to enjoy without fearing someone is going to steal it! 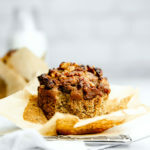 Finally a muffin is kind of a small version of a cake, so you have all the components, textures and flavors gathered in just one little treat. Streusels always bring that special touch and crunchiness to upgrade any simple muffin or cake recipe and it’s honestly the easiest thing to do. Regular streusel is usually made of butter, sugar, flour and nut meal in a 1:1 ratio, all mixed together. 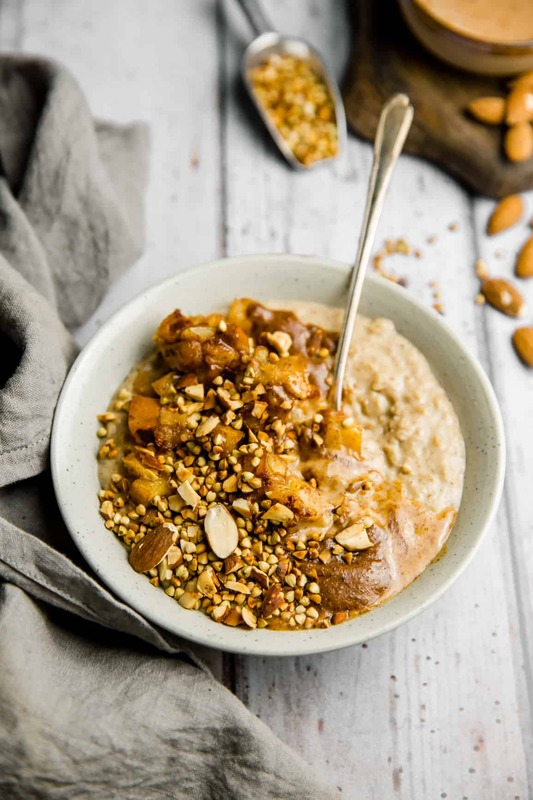 But you can imagine that I wanted to make this recipe a little lighter and healthier, so this is my own version for a healthy but delicious streusel. Dates and cranberries when very finely chopped form a thick and sticky paste that is perfect to bind ingredients together and to bring some natural sweetness. To make the paste, simply chop them very finely using a large chef knife until completely pureed. If possible, use medjool dates which are very soft and moist, so easier to work with, and with a yummy caramel flavor. Chopped walnuts replace the nut meal for an extra crunchiness as well as interesting nutritional incomes. Obviously you can substitute walnuts for any nuts of your choice : try pecans, almonds or peanuts. To make the streusel, make sure you’re using solid coconut oil to get the right texture. Then all you have to do is to mix all the ingredients together. 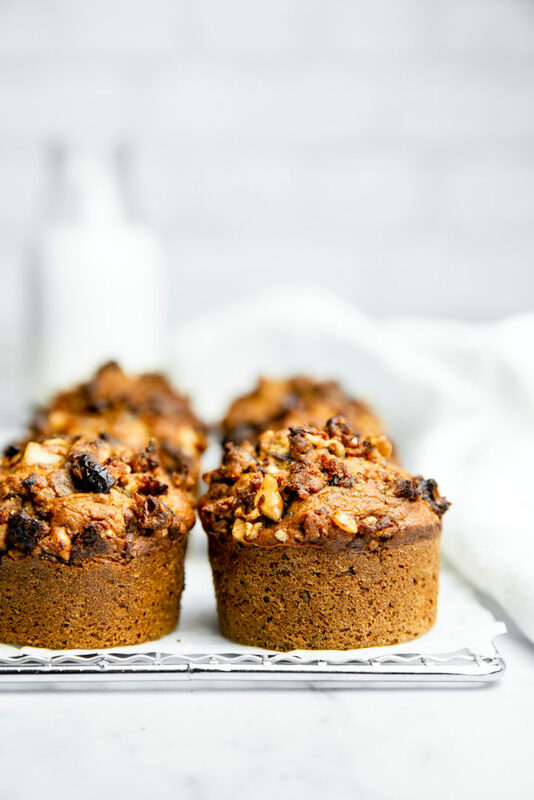 Don’t hesitate to use your hands to massage the streusel, it’ll make it easier to get that crumbly texture – also a good reason to lick your fingers. When preparing your muffins, fill the liners all the way up to the top before sprinkling the streusel on top. Don’t worry, while baking the muffins will grow up and get this nice generous rounded shape. Be careful during the last minutes of the baking time. To help the muffins to rise, we have put a slightly higher temperature, and as each oven is different, the baking time can vary from a few minutes. I recommend to set your timer for 16 minutes first and check the cooking using a toothpick. Then return to oven and watch your muffins : the streusel on top should be golden but can burn pretty quickly. If the tops start to burn but the muffins are not yet baked, cover the muffins with a piece of aluminium foil and finish the baking. 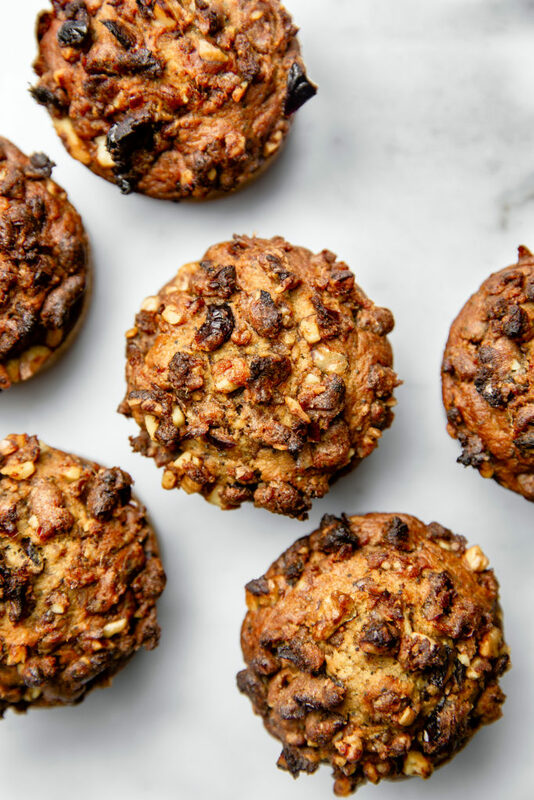 These muffins with dry cranberries, walnut, zesty orange and poppy seeds are the best seasonal treat. Packed with wholesome ingredients, low in sugar and fat, they’re the perfect healthy alternative to regular sweets. Enjoy as your afternoon snack with a cup of tea. Using a knife, finely chop the pitted dates and cranberries until you get a paste consistency. Place in a bowl and add the walnuts finely chopped. 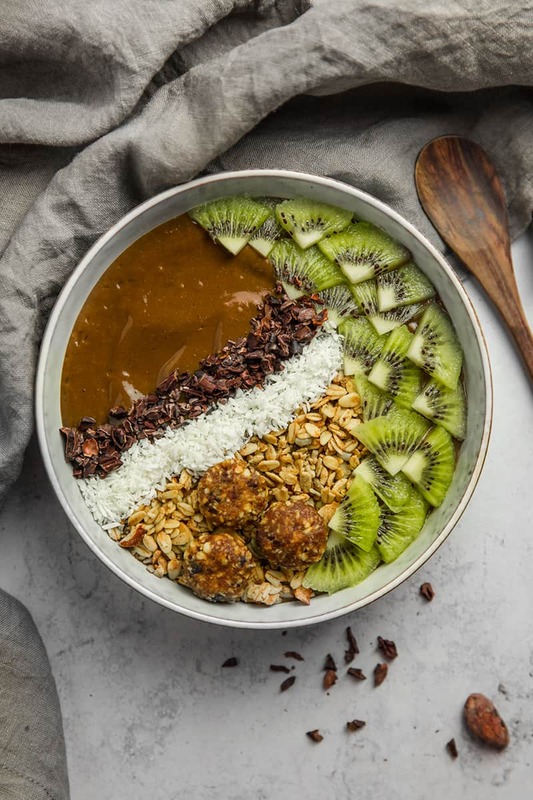 Fold in the solid coconut oil, spelt flour and cinnamon and massage all the ingredients using your hands or a fork to incorporate until a crumbly. Set aside. Preheat your oven to 375F and insert 12 liners into a muffin tin. Meanwhile, mix the almond milk with the apple cider vinegar, stir and set aside. In a large bowl, whisk together the flours, baking soda, baking powder, salt, coconut sugar and cinnamon. Roughly mash the banana using a fork until purred. 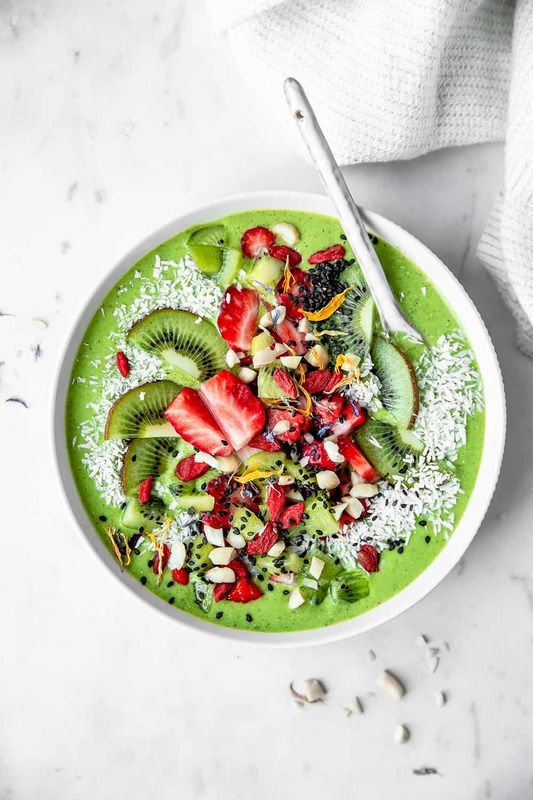 In a separate medium bowl, whisk the mashed banana, thickened flax egg, almond milk, melted coconut oil, orange juice and vanilla extract. Pour the wet ingredients in the dry mixture and stir to combine until you get a smooth batter. Fold in the dry cranberries, roughly chopped walnuts, orange zest and poppy seeds. Pour the batter into the 12 muffin molds and sprinkle the streusel on top. Bake for 18-20 minutes or until a toothpick in the middle comes out clean. Lets cool down a couple minutes before removing from the mold. For a gluten free version, you can sub the spelt flour for any gluten free baking mix. I highly recommend using Medjool dates for the streusel as they are the softest and easiest to work with. Ces muffins cranberries et orange au streusel de noix croquant sont parfait pour le goûter avec une tasse de thé, le dessert ou encore le petit-déjeuner. A l’aide d’un couteau, hacher finement les dattes dénoyautées et les cranberry jusqu’à obtenir une pate collante. Placer dans un bol avec les noix finement hachées. Ajouter l’huile de coco solide, la farine et la cannelle et malaxer avec les mains ou une fourchette pour incorporer tous les ingrédients, jusqu’à obtenir un mélange granuleux et friable. Réserver. Préchauffer le four à 190°C et chemiser un moule à muffins. Préparer le flax egg en mélangeant les graines de lin moulues avec 6 cuillères à soupe d’eau. Bien remuer et laisser reposer 5 minutes. Les graines de lin vont absorber l’eau et épaissir le mélange. Pendant ce temps, mélanger le lait d’amande avec le vinaigre de cidre, remuer et laisser reposer. Dans un grand saladier mélanger les farines, le bicarbonate de soude, la poudre à lever, le sel, le sucre de coco et la cannelle. A l’aide d’une fourchette, écraser grossièrement la banane jusqu’à obtenir une purée. Dans un bol moyen, mélanger la banane écrasée, le flax egg, le lait d’amande, l’huile de coco fondue, le jus d’orange et l’extrait de vanille. Verser le mélange humide dans le saladier d’ingrédients secs et mélanger jusqu’à obtenir une pâte bien lisse et fluide. Incorporer les cranberries, les noix grossièrement hachées, les zests d’orange et les graines de pavot. Remplir les 12 moules à muffins du mélange et répartir le streusel aux noix au dessus. Faire cuire pendant 18-20 minutes, jusqu’à ce que les muffins soient bien dorés et qu’un cure dent planté au centre ressorte propre. 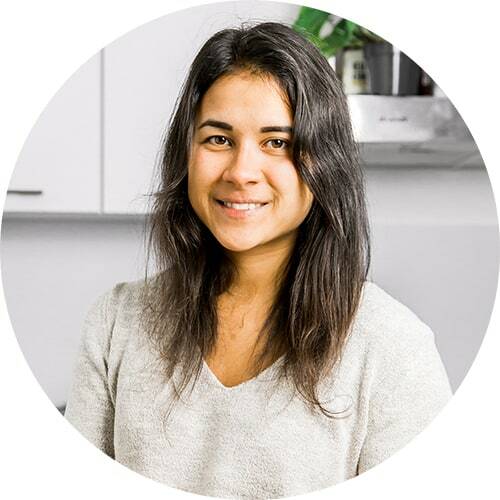 Pour une versions sans gluten, remplacer la farine d’épeautre par le mélange de farine sans gluten pour patisserie de votre choix. Préférer des dattes de variété medjool pour le streusel, elles sont plus tendres et facile à travailler.